I am missing those Ekushey February nights this moment. The environment of 21st February remains completely different than other 364 days in some places in Bangladesh. I was a resident of Salimullah Hall, Dhaka University. The road in front of the hall is the entry road of Shaheed Minar. Think about the scenario of the night. Thousands of people are going to show respect to the martyrs with flowers, ekushey song ‘Amar Bhaier Rokte Rangano Ekushey February…’ is playing continuously, it is strange night, a great night. it has its own attraction. No one can stay inside home in this area. I am missing this night. 21st February has very core value behind Bangladesh. We can talk in our mother language because of the day. Salam, Barkat, Rafique, Jobbar, and many others had sacrificed their lives on 21st February, 1952. We can talk in Bangla for this. This day influenced Bangladeshis to create an independent Bangladesh. So this day is the most valuable day for us. 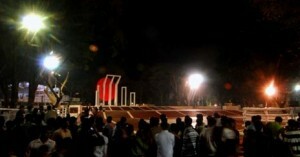 Shaheed Minar and Dhaka University attract me in this night. …but I am far away from the place… missing… missing…. Missing. Do the visitors know that eleven Bengalee youths lost their lives in police firing in Silchar town of Assam (India)for the cause of Bengali language on 19th May 1961. The names of those Bangla Bhasha Shahid are Kamala, Sachin, Hitesh, Sukamal, Kumud, Sunil, Biren Satyen, Tarani and Chandi? This legacy has totally been forgotten. Hope their names will be remembered also on each 21st February in Bangladesh. “Aa mori bangla bhasha”. I didn’t hear this history before. Where can I find the history? Can you please help me? I am very interested. Thanks for showing interest. You google “Unishye May” and get your entry point. Please remember those 11 bangla bhasha shahids on 21 February.